Axis Bank is the Internet Payment Gateway for Debit Card and Credit Card payments for product purchase on Jagoeve and Net Banking payments are effected by Axis bank Net banking partner Payumoney. 100% protection is there for your card and account details. Unlike other websites, Jagoeve does not store or save your card and bank account details. Free Shipping is there all over India for all orders placed at jagoeve. For Orders less than Rs 999/-, the buyer can also opt for Express Shipping by paying additional Rs 69/- only. For Orders above Rs 999/- Free Express Shipping is done via Speed Post or Express Parcel. Buyer Friendly Return Policy facilitates EASY return & FREE exchange for products with size and colour mis-match or for wrong items shipped. Place the return request and Just print the Return Invoice and paste it on the parcel and ship to the seller. Jagoeve shall take care of the rest. Cancel an Order your placed and Immediately get the refund issued in form of Jagoeve Refund Vouchers. You can continue shopping with the refund voucher issued or avail easy cash refund back into your bank account. Debit/ Credit Card | Net banking | Cash On Bank (COB) * Better than COD: Without using Credit/ Debit Card or Net Banking, easily buy the products you like from Jagoeve using Cash On Bank [COB]. Select your product & place order by choosing COB as your payment option and we will confirm it using your mobile number. Go to your nearest bank and remit the order value in cash directly in Jagoeve bank account and send ‘Yes’ to us from your mobile number. Your order will be processed and rushed to you. SHOP NOW using COB Facility & get Additional 3% Discount of the order value in form of Special Gift Coupon from jagoeve. Sorry, unfortunately, this seller does not have delivery to your pincode. However, from the list below, you can order the same product from other sellers who can deliver to your Pincode. 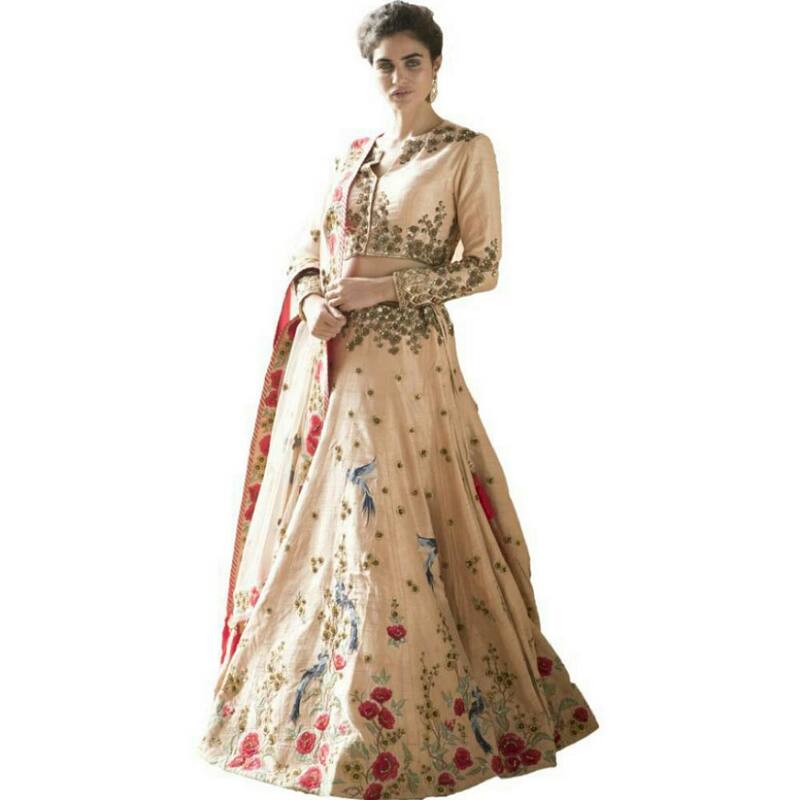 Gorgeous and traditional semi stitched Cream colored Silk Designer Lehenga Choli for women with exquisite designs. The beautiful Embroidered design on this Cream Color looks gracefully elegant. This Silk material Lehenga Choli feels good on the skin. The Blue colored blouse is made of Silk material. The elegant Blue colored Dupatta of Net material with lace bordered design matches this Lehenga Choli perfectly; bringing out your best looks. This latest Lehenga Choli, also known as Ghagra Choli, is your perfect choice for wedding .